Published: March 29, 2014 at 01:34 p.m. Updated: March 30, 2014 at 03:51 p.m.
On Friday's edition of the "Around The League Podcast," Kevin Patra predicted the St. Louis Rams will end up trading out of the No. 2 spot in the 2014 NFL Draft. Speaking to reporters at this week's NFL Annual Meeting, coach Jeff Fisher said there's nothing brewing on that front just yet. "(We have) not really had any discussion with anybody," Fisher said, via ESPN.com, "but that doesn't mean to say we won't." Fisher conceded it's "highly unlikely" the Rams would receiver the same value in a trade offer as they did with the Robert Griffin III blockbuster two years ago. 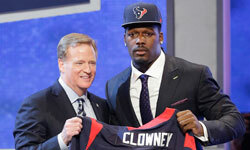 He's doing his best to pump up the draft stock of Jadeveon Clowney, though, telling reporters he's learned over the years that NFL teams can never have enough pass rushers. "And I think not only us, but other teams that are in our situation," Fisher said, via the St. Louis Post-Dispatch, "are creative enough to find ways to get (Clowney) on the field and put him in position to make plays." Fisher bristled at the notion that Clowney's disappointing production at South Carolina last season is a red flag for his NFL prospects. "Not if you watch the games, it's not," Fisher continued. "Because the effort's there. You've got to give offenses credit, too." If the Rams do hold onto the No. 2 pick, Fisher hinted that his front office will pass on Clemson wide receiver Sammy Watkins. "I think with what we have on the roster right now, we can provide Sam (Bradford) with the talent to where we can win a lot of games," Fisher explained. "We're expecting improvement (from the wide receiver corps)." NFL Media's "Mock Draft Central" projects St. Louis to pull the trigger on an offensive tackle such as Auburn's Greg Robinson or Texas A&M's Jake Matthews.